Guelaguetza is a word loosely meaning “reciprocation,” referring to the exchange of financial and hands-on help that neighbors give each other in the outlying pueblos. In those towns with no shopping malls, movie theatres, art museums or other venues of first-world entertainment, fiestas are the main social interaction, marking the circle of life: baptisms, quinciñeras, weddings and funerals. And paying for those fiestas is no small thing on a weaver’s or tortilla-maker’s budget. You invite everyone you know, possibly the whole town, feed them and take a load off of those working feet, usually for most of the day. In a cash-based society where there’s rarely even a bank in town, you pony up food or drink when your neighbor needs it, and they in turn chip in when it’s your turn to hold the fiesta. Elaborate notebook lists are kept of who did what when and for how much. Guelaguetza is a sort of cultural Mardi Gras that normally brings millions of pesos in tourist business to this capital city from Mexico City and beyond. Sadly, not this year. With the marches and blockades of the past month of protesting teachers and their counterpart armed federales monitoring the situation, tourism in the city is at a crippling low, some estimates projecting 80% or more down. Hundreds of hotel reservations have been cancelled; first-class buses haven’t run for a month; some downtown restaurants have boarded up and closed for good. The tourist office is still gamely handing out Guelaguetza brochures and it’s still printed that Sunday concerts will take place “under the laurel” in the zocalo, though protestors’ tents are camped in that very spot. No word on where the replacement venue will be. When asked, our Mezquite waiter just smiled and shrugged and said surely the brochure must be right if it was printed there. In the meantime, the Escaleras del Fortin – the steps up to the Guelaguetza auditorium that all foot traffic takes – are under construction, and in fact at this writing are just a big pile of step-shaped dirt. The side wings of the auditorium itself are being put up (again), possibly for the second or third time as the first attempts over several years have blown down. The main street of Garcia Vigil has been under construction all month as masons labor night and day to install street-level lighting and a bicycle path. Oaxaca is a painted old lady with her rouge smeared and graffiti on her lovely bright walls: sometimes artistically lovely but often as not just politically strident phrases spray-painted onto peeling paint. The stairs aren’t ready, the streets aren’t fixed, the performance venues will have to accommodate the protestors, and public transportation may or may not be in place to bring in an audience. But for a beautiful cool evening in July, the women swirled with their colorful skirts in the colors of the arcoiris and balanced flower-wreathed baskets on their heads; the men dipped and bowed in their white cotton tunics and pants, and the brass band played on. Despite her achey back and the too-bright lipstick smeared on her teeth, the painted lady is still beautiful. She’s a grand old dame. 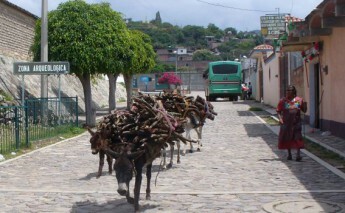 See more in Oaxaca: The Good, the Bad and the Ugly.